Netholi / Kozhuva / Anchovies is a small fish which is popular in Kerala. First cut and clean the fish and then again clean it by adding some crystal salt. Wash it nicely by changing the water 2-3 times and then allow it to drain. 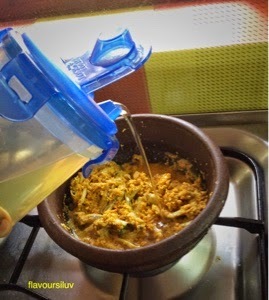 Add coconut, ginger, green chillies, curry leaves, shallots, red Chilli powder and turmeric powder in a small jar of mixer grinder and just grind it for just 2-3 pulses by adding 1 tbsp of water. 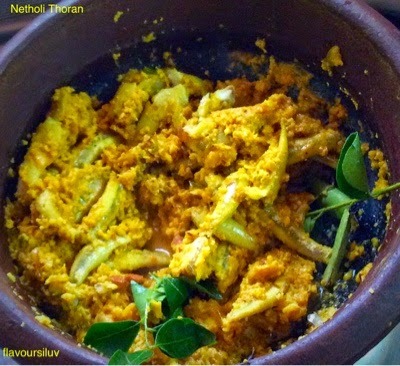 In a earthen pot ( Munchatti ), mix fish with crushed coconut mixture and add tamarind paste to it. Cook in medium flame by adding little water till it boils, then reduce the flame and cook covered for about 10 minutes. Then cook uncovered till almost all the water is evaporated. Finally add 2 tbsp of coconut oil and few curry leaves. Serve hot with plain rice! Tooo goood, love this like anything!! !